Preston Medical Library is more than an information center. 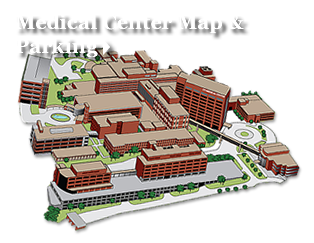 The library’s mission is to assist the University of Tennessee Medical Center in providing excellence in healing, education, and discovery. One of the library’s values is innovation. We actively pursue new ways to provide services essential to our patrons. In April 2012, Preston Medical Library partnered with the Human-Animal Bond in Tennessee (H.A.B.I.T.) to offer canine assisted stress-reduction visits. The H.A.B.I.T. dog visits help promote education, increase empathy, improve communication, and reduce stress. In collaboration with the University of Tennessee College of Veterinary Medicine and the Human Animal Bond in Tennessee (H.A.B.I.T. 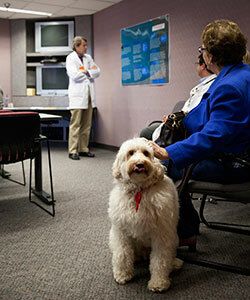 ), Preston Medical Library hosts regular canine-assisted stress reduction visits. To prepare for participation in the H.A.B.I.T. program, Preston staff attended a mandatory information session. The session covered everything from how the dogs are temperament tested and selected for service to the careful health screenings required for the dogs. The session also included information on the benefits of the human-animal bond. H.A.B.I.T. visits currently occur weekly on Mondays from noon to 1:00 p.m. Cancellations sometimes occur due to weather or illness. If you are planning a visit to coincide with when the H.A.B.I.T. dogs are at the library, please call 865-305-9525 in advance to confirm they will be visiting. To find out more about H.A.B.I.T. dog visits at Preston Medical Library, contact Rachel Roberts at RERoberts@utmck.edu or 865-305-8777. In conjunction with the Human-Animal Bond in Tennessee (H.A.B.I.T. ), the library hosts canine assisted stress-reduction visits twice weekly on Mondays and Wednesday from noon-1:00 p.m.